Relay transmission can enhance coverage and throughput, whereas it can be vulnerable to eavesdropping attacks due to the additional transmission of the source message at the relay. Thus, whether or not one should use relay transmission for secure communication is an interesting and important problem. In this paper, we consider the transmission of a confidential message from a source to a destination in a decentralized wireless network in the presence of randomly distributed eavesdroppers. The source-destination pair can be potentially assisted by randomly distributed relays. For an arbitrary relay, we derive exact expressions of secure connection probability for both colluding and nonpolluting eavesdroppers. We further obtain lower bound expressions on the secure connection probability, which are accurate when the eavesdropper density is small. Using these lower bound expressions, we propose a relay selection strategy to improve the secure connection probability. By analytically comparing the secure connection probability for direct transmission and relay transmission, we address the important problem of whether or not to relay and discuss the condition for relay transmission in terms of the relay density and sourceâ€“destination distance. These analytical results are accurate in the small eavesdropper density regime. C A Dhote, Virendra P Nikam. "An Optimize Utilization of Carrier Channels for Secure Data Transmission, Retrieval and Storage in Distributed Cloud Network using Key Management with Genetic Algorithm: A Review." 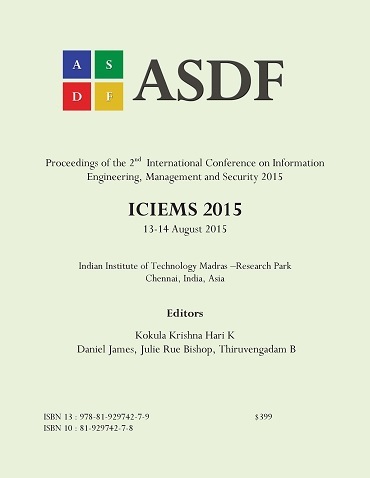 International Conference on Information Engineering, Management and Security (2015): 152-158. Print.